One of my chairs is included in the exhibition Pair//Pâr curated by Oriel Myrddin Gallery and Carmarthenshire Museums Service at Parc Howard in Llanelli. These hand made chopping boards featured in a recent photo shoot for Oriel Myrddin Gallery in Carmarthen. Lovely to see them alongside work from fantastic potters, Silvia K Ceramics, James Burnett-Stuart and Peter Bodenham! I’ve just delivered another hand carved Ash wood bench to Oriel Myrddin Gallery in Carmarthen for their annual Makers Market exhibition – open until 30 December. A seat to accommodate you and your coffee cup! The 2017 Makers Market is open at Oriel Myrddin Gallery in Carmarthen and I’m really pleased to be showing three stools hand carved from wood sourced in west Wales as well a selection of hand carved spatulas. This recent commission was for harpist Ceri Owen-Jones, I was asked to make a stool for Ceri to use whilst performing. The seat is made from Sycamore wood from Llanina and the legs are Ash sourced in Newport, Pembrokeshire. Using a drawknife askew on this elm creates long springy thick shavings. 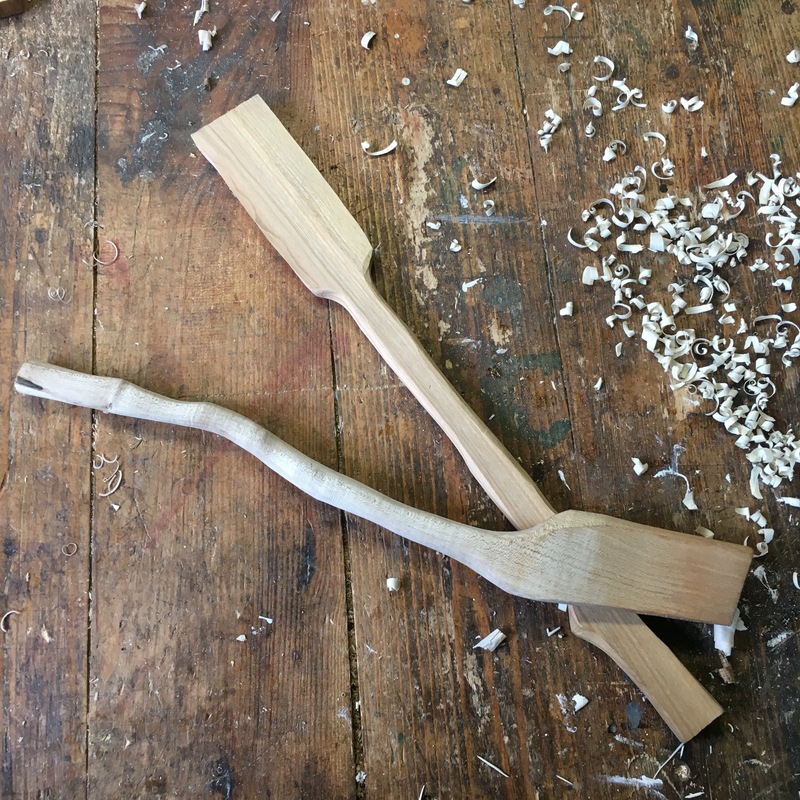 I’m making the legs for a carved oak bench, similar to a previous version I made earlier in the year. Shown with Ashley Iles London pattern gouge and a finer (and smaller) drawknife than above, forged by James Howarth. Two lovely tools, very old and very new. Spatulas on the workbench today. Handmade from cherry, sycamore and holly.